In 25 words or less: Teacher outdoes pupil. Also, the Yankee offense is way better than that of Seattle, though only two pitches did in Felix. This one featured Randy Johnson going up against Felix Hernandez, in other words, the most anticipated pitching matchup of the year in Seattle. It sure beats something like Ryan Franklin against Jake Westbrook or something. Gil Meche against Josh Towers. Most of the matchups you can think of this year involving a non-Felix/non-Moyer pitcher. Taking hold. Derek Jeter walked on a 3-1 dirtball that got away. Hideki Matsui bounced the second pitch to short, starting the 6-4-3 double play. Gary Sheffield got the hitters' counts and walked on a 3-1 high and inside change. Alex Rodriguez took an 0-1 pitch barely inside and eventually rolled to short for a 6-4 fielder's choice. Dominant. Ichiro badly whiffed on a 2-2 slider way outside. Jamal Strong bounced an 0-2 pitch to short. Raul Ibañez got ahead 3-0 before taking a full-count slider over the outside corner. Solid. Jason Giambi lined the second pitch to Strong in fairly deep centerfield. Tino Martinez took an 0-2 deathly curve over the outer half for strike three. Matt Lawton got ahead 3-0 before grounding a 3-1 pitch to Richie Sexson for a 3-1 putout. Sheesh. Richie Sexson got under a fly ball to centerfield. Adrian Beltre took a full-count pitch down and in for a walk. Jose Lopez whiffed on a 1-2 fastball. Mike Morse took a 1-2 fastball over the inside corner. Tarnish. John Flaherty whiffed on a 1-2 deathly and dirty curve low and away. Robinson Cano golfed the second pitch just over the rightfield wall. Jeter took a 1-2 fastball over the outside corner. 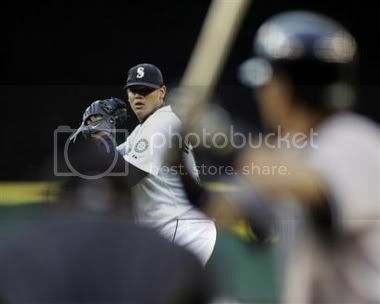 Matsui bounced a 2-2 pitch to second. Still nothing. Yorvit Torrealba bounced a 2-2 pitch to short. Yuniesky Betancourt fell behind 0-2 and ended up grounding a 1-2 pitch hard to short. Ichiro chopped a ball down the third-base line, where Rodriguez ranged into foul territory and threw off-balance and in time to first on a great play. Another small stain. Sheffield jumped on the second pitch, a high fastball, and crushed it into the Mariner bullpen. Rodriguez got ahead 2-0 before taking a 2-2 pitch over the outside corner. Giambi took a 1-2 curve barely off the outside corner before walking on a high full-count breaking ball. Martinez grounded to first for a 3-6-1 double play. Shutdown. Strong chopped the first pitch up the middle to Cano. Ibañez got ahead 2-0 before grounding out hard to third. Sexson took a questionable low 2-0 strike before walking on a 3-1 pitch inside. Beltre smoked a ball right to Rodriguez at third. Better. Lawton bounced a 3-1 pitch to second. Flaherty whiffed on a high 0-2 fastball. Cano grounded a 1-2 pitch to third. Zeroes galore. Lopez popped an 0-2 pitch to Matsui in leftcenter. Morse fell behind 0-2 and later fisted a 1-2 pitch to a charging Matsui in centerfield. Torrealba supposedly couldn't hold a 1-2 checkswing. Settling? Jeter bounced the first pitch to second. Matsui took an 0-2 curve over the outside corner for strike three. Sheffield got the hitters' counts and bounced out to third on the 3-1 pitch. Frustrating. Betancourt bounced a 1-2 pitch off the track and wall by the manual scoreboard in leftfield. Ichiro bounced the second pitch to short, moving Betancourt to third. Strong took a 2-2 fastball over the inner half. Ibañez fell behind 0-2 before popping a 1-2 pitch high and foul in front of the stands on the right side, where he moved to the wall and drifted back, taking the ball off the heel of his glove. Ibañez hit a 1-2 broken-bat grounder to third on the next pitch. Treacherous. Rodriguez walked on four pitches. Giambi lashed a single into rightfield, moving Rodriguez to second. Martinez hti a broken-bat 0-2 bouncer up the middle to Betancourt, who stepped on second and converted the 6-3 double play as Rodriguez moved to third. Lawton lined a 3-0 pitch right into Beltre's glove at third. This one's a loss. Sexson took a 2-2 fastball probably a bit high and in for strike three. Beltre crushed the second pitch right to Rodriguez, whose wide throw (rushed) luckily took Martinez off the bag at first. Lopez lasered an 0-2 pitch up the middle for a single, moving Beltre to second. Morse popped the second pitch to Matsui drifting back in centerfield, moving Beltre to third. Torrealba had some words with Ron Kulpa behind the plate after a 2-1 inside fastball, then rolled the 2-2 pitch to short for a 6-4 fielder's choice (close play). Nice finish. Flaherty fell behind 0-2 before poking a 1-2 pitch up the middle off of Hernandez and to Lopez for a 1-4-3 putout. Cano poked a 2-0 pitch up the middle. Jeter bunted the first pitch along the first-base line, moving Cano to second. Matsui whiffed on a 2-2 dirtball curve. Tom Gordon came in for Johnson. Betancourt flew out high to centerfield on a 2-2 pitch. Ichiro flared the second pitch to Cano in shallow rightcenter. Jeremy Reed, hitting for Strong, whiffed on a 2-2 pitch outside. Jeff Nelson came in for Hernandez. Sheffield hit a fly to leftfield, and Morse went back on it, letting it drop in front of him for a single on the first ball to him in leftfield this season. Rodriguez popped to Lopez on the right side. Matt Thornton came in for Nelson. Giambi flew out high to leftfield on a 1-2 pitch (yay Morse). Bernie Williams, hitting for Martinez, got the hitters' counts and walked on a 3-1 pitch way outside. Lawton popped high to Ichiro in shallow rightfield. Mariano Rivera came in for Gordon. Ibañez fell behind 0-2 before splintering his bat on a 1-2 popout to rightfield. Sexson poked the first pitch up the middle for a single. Beltre whiffed on an 0-2 fastball that was about a foot high. Lopez flew out to shallow rightfield on a 2-0 pitch. Ballgame. Aside from his strikeout in the ninth on a pitch that was about a foot high, Beltre was one of only two Mariners (Richie Sexson) to reach base twice. Twice he ripped the ball hard toward Alex Rodriguez at third. The first time, the ball was lined right into Rodriguez' glove. The second time, Rodriguez' throw was wide, giving Beltre the single. He also drew a walk. With that, Beltre finished with a .288 average in the month of August, though he didn't homer after the 20th. It was his best month since his .321 May. He's raised his slugging percentage in each of the last three months, with August being his sluggingest month with a .545 mark. He's been coming along slowly but surely, which is good to see him finally do, though I know he's nowhere close to being all the way to where he's supposed to be. Defensively, I think it'll hard for him to get a Gold Glove since Eric Chavez is overrated (though less so now than before) and Alex Rodriguez now plays third. Since Beltre is having an off year at the plate, he'll get the Jeff Cirillo shaft in the Gold Glove voting. Sure, he wasn't the only Mariner that went 0-for-3 against Randy Johnson. People go 0-for-3 against Randy Johnson, there's nothing you can do about that. This game, however, marked the grand opening of the Mike Morse Leftfield Experience. After making his first start in leftfield and somehow not having a ball hit to him, he took a first step back on a Gary Sheffield shallow fly ball but took a little too long to judge it, eventually letting it drop in front of him. Frankly, it reminds me of the leftfield adventures before Randy Winn came to Seattle. Let's all take a moment to the times of Glenallen Hill, Butch Huskey, Al Martin...good times, huh? Might we be back to the times where leftfield will truly be a place where you just sort of stick a guy and hope his bat comes through? It's definitely what they've done with Morse, though his bat hasn't gotten crazy hot in his most recent accumulation of playing time. I know we're all probably hoping for him to rip it up like he did his first few weeks with the big club, but it'll probably be a while before that happens again. This wouldn't be such a problem if Chris Snelling was healthy. Snelling's injured so much that I can't even remember the injury that put him out for the rest of this season. What can you say? Randy Johnson dominated the Mariners. What few scoring chances the Mariners had were easily snuffed out by Randy and the Yankees. None of the scoring chances came until the sixth since the Mariners didn't get a hit until Yuniesky Betancourt led off the inning with the only Mariner extra-base hit of the night. Ichiro moved him to third before Jamal Strong was humbled and Raul Ibañez couldn't take advantage on the blown foul fly to Tino Martinez. Adrian Beltre was on second with one out in the seventh and never crossed the plate. That was it for the night as the Mariners were completely fazed by Randy Johnson. They couldn't hit him. Five baserunners in seven innings won't exactly add up to a win. If those five baserunners reached on five solo homers, then it might add up to a win, but the odds of this particular team doing such a thing are beyond astronomical. Five solo shots on the road would be one thing, but five solo shots at a home game would be even more crazy. Yes, I miss offense. As for Felix, he walked Derek Jeter to lead off the game, and though it didn't set an overriding tone to the game, Hernandez just wasn't quite as sharp as we've seen him. The other thing to consider is that we're saying this about Felix despite the fact that he got through eight innings, struck out seven, and only surrendered four hits. The bad thing was that he made the two mistakes to Robinson Cano and Gary Sheffield which scored the only runs of the game. I'm raising more of an eyebrow with the four walks than the two homers, because homers are going to happen every once in a while. I guess the positive thing out of the homers is that he managed to yield them both with nobody on base. Even still, I look at the line for Felix in this game, and I have to say that if these are what the growing pains are going to be like for Felix, I'll be sitting with baited breath just waiting for how it'll be when he's actually good. He's been crazy-good already, but it's mind-blowing to think he could be better than we've seen so far. -- he needs 36 hits to reach 200 for the season; he'd need to hit .287 for the remainder of the season, and that'd leave him with a .295 season average. -- he needs 39 hits to finish with a .300 average for the season; he'd need to hit .311 for the rest of the season, and he'd end up with 203 hits. -- he needs 53 hits to finish with a .320 average for the season; he'd need to hit .422 for the rest of the season, and he'd end up with 217 hits. I'd have to say the goal for the series was to take two of the four games against the Yankees, but the day game has Joel Piñeiro starting, so chances probably aren't good. However, Jaret Wright will be throwing for the other guys, so maybe there's a chance.